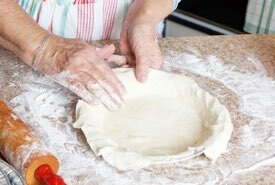 Learning how to make pies the old fashioned way is an art that's easily mastered, especially when you have pie and pastry tips from Grandma's day. Mom made pies every week when I was a boy. And I have yet to find anything that can surpass the fragrant, sweet aroma of a freshly baked pie as it sits cooling on an open window sill. Sometimes that pie never got a chance to cool before it disappeared! The practical baking tips below reveal how to make pies using any dessert pie recipe on this site. You can make a delicious homemade pie from scratch that's perfect for any occasion. Why not bake one tonight? Make your Grandma proud. Use the best materials in making pastry; the shortening should be fresh, sweet, and hard; the water cold (ice water is best), the paste rolled on a cold board and all handled as little as possible. When the crust is made, it makes it more flaky and puff more to put it in a dish covered with a cloth and set in a very cold place for half an hour, or even an hour; in summer, it could be placed in the icebox. 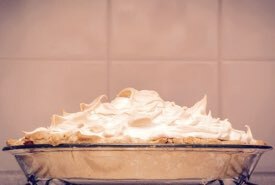 A great improvement is made in pie crust by the addition of about a heaping teaspoonful of baking powder to a quart of flour, also brushing the paste as often as rolled out, and the pieces of butter placed thereon, with the white of an egg, assists it to rise in leaves or flakes. As this is the great beauty of puff paste, it is as well to try this method. If currants are to be used in pie making, they should be carefully picked over and washed in several waters, dried in a towel and dredged with flour before they are suitable for use. Raisins, and all dried fruits for pies and cakes, should be seeded, stoned and dredged with flour before using. Almonds should be blanched by pouring boiling water upon them and then slipping the skin off with the fingers. 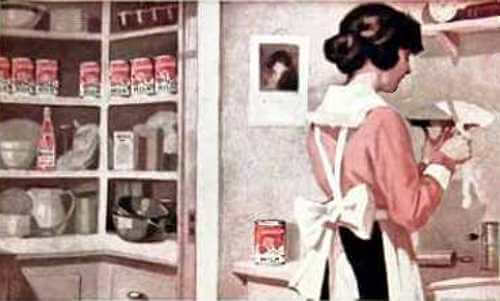 In pounding them, always add a little rose-water or orange-water, with fine sugar, to prevent their becoming oily. Great care is requisite in heating an oven for baking pastry. If you can hold your hand in the heated oven while you count twenty, the oven has just the proper temperature and it should be kept at this temperature as long as the pastry is in; this heat will bake to a light brown and will give the pastry a fresh and flaky appearance. If you allow the heat to abate, the under crust will become heavy and clammy and the upper crust will fall in. Another good way to ascertain when the oven is heated to the proper degree for puff paste: put a small piece of the paste in previous to baking the whole, and then the heat can thus be judged of. 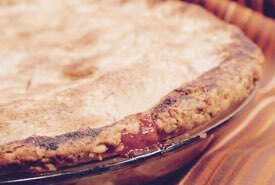 Pie crust can be kept a week, and the last are better than the first, if put in a tightly covered dish and set in the ice chest in summer and in a cool place in winter, and thus you can make a fresh pie every day with little trouble. 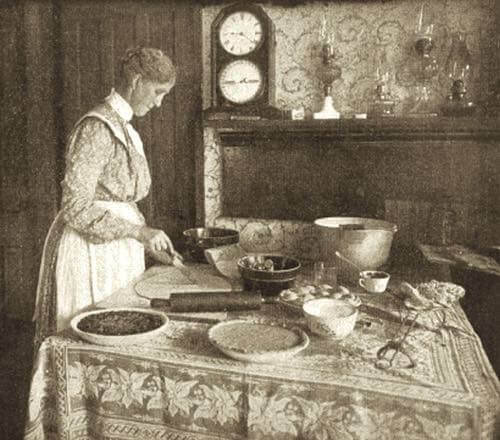 In baking custard, pumpkin, or squash pies, it is well, in order that the mixture may not be absorbed by the paste, to first partly bake the paste before adding it, and when stewed fruit is used, the filling should be perfectly cool when put in, or it will make the bottom crust sodden. After making the crust, take a portion of it, roll it out and fit it to a buttered pie plate by cutting it off evenly around the edge. Gather up the scraps left from cutting and make into another sheet for the top crust; roll it a little thinner than the under crust; lap one-half over the other and cut three or four slits about a quarter of an inch from the folded edge (this prevents the steam from escaping through the rim of the pie, and causing the juices to run out from the edges). 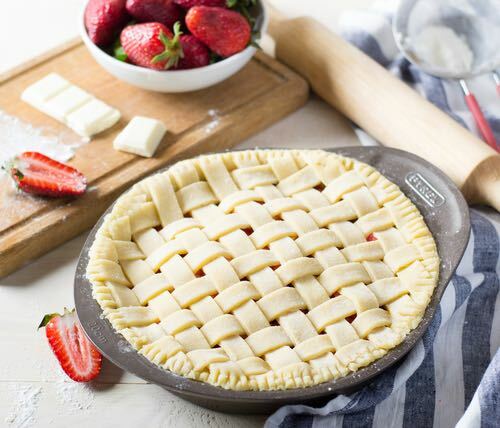 Now fill your pie plate with your prepared filling, wet the top edge of the rim, lay the upper crust across the center of the pie, turn back the half that is lapped over, seal the two edges together by slightly pressing down with your thumb, then notch evenly and regularly with a fork, dipping occasionally in flour to prevent sticking. Bake in a rather quick oven a light brown, and until the filling boils up through the slits in the upper crust. To prevent the juice soaking through into the crust, making it soggy, wet the under crust with the white of an egg, just before you put in the pie mixture. If the top of the pie is brushed over with the egg, it gives it a beautiful glaze. That's how to make pies as Grandma made them.